American Journalism Review, the media watchdog publication that ceased printing its magazine in 2013, said Friday it will shutter online production after running out of money, reported Anita Balakrisnan in USA Today on 31 July 2015. “Unfortunately, we are unable to provide the resources needed to keep AJR the vibrant, innovative online publication it deserves to be,” said Lucy Dalglish, dean of the Philip Merrill College of Journalism at the University of Maryland, which produces the digital news service. AJR will not produce new content, but online archives will remain available, according to a statement by the university. 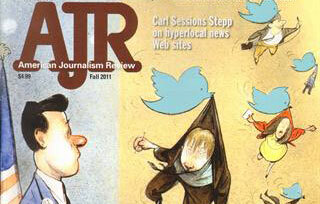 AJR was known for covering the changing media landscape since its inception in 1977, featuring profiles of news organizations and providing guidance and commentary on how journalists can better use technology or cover controversial issues. Its coverage was closely followed in the media business, along with competitors like Poynter andColumbia Journalism Review, according to a detailed autobiography of the publication . The media service also served an educational purpose. It was tied with the curriculum at the college of journalism, and alumni went on to be reporters at publications like Reuters, Newsday, Newsweek, Capital New York and CNN. Former editor Rem Rieder is a media columnist and editor-at-large at USA TODAY. Originally a print publication called Washington Journalism Review, the publication evolved and changed ownership through the years, finally going digital-only in July, 2013. “Over many decades, American Journalism Review has been an incredible value both to the college and to American journalists,” Daglish said.